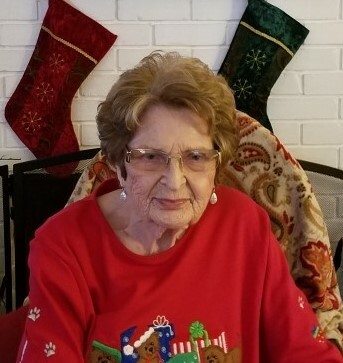 Mary Elizabeth Kimbrough, age 86, passed away November 1, 2018. A graveside service will be held Monday, November 5, 2018, at 11:00 a.m. at Evergreen Baptist Church Cemetery on Gunwalerford Road, Florence. Mrs. Kimbrough was a kind and loving mother, grandmother and great-grandmother. She lived for her family. She always saw the good in people and was loved by all who knew her. She was preceded in death by her husband, James M. Kimbrough and son, David Richard Kimbrough. Survivors include her daughter, Joan Kimbrough; grandchildren, Christy Borden (Ricky) and Kayla Kimbrough; great-grandchildren, Brandon Borden and Justin Borden; and her furry friends, Tigger, Duke, Maggie and Barney. Pallbearers will be Marty Smith, Ricky Borden, Danny Sharp, Eddie McKinney, Brandon Borden and Justin Borden. The family would like to express their appreciation to Keller Home Health for their loving care. Joan, I am so sorry for your loss. Your Mom was a very precious gift in your life and I know you will miss her dearly, as do all of us who have lost our Moms..
We are thinking about you. Our prayers are with you and we are here for you. We love you bunches.